Purification is a necessary procedure for both recombinant and non-recombinant proteins with human use. These proteins are produced in host organisms altogether with other molecules from whom they must be separated in order to obtain a pure and useable extract. The purification process includes lots of factors to take into account, such as choosing the most appropriate technique, protein stability and other properties, and the desired purity grade. 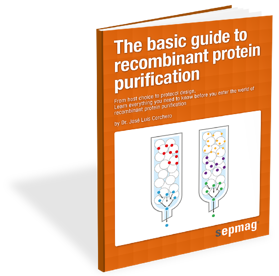 In this guide you will find useful guidelines to:We have prepared this protein purification handbook in order to provide you with a great insight of the whole process, including key ideas and tips to understand and master it. The deep knowledge of Dr. José Luis Corchero from IBB-UAB, specialist in protein purification and author of this guide, is now at the reach of your hand for you to get the best results in your work with proteins. Lots of additional valuable information and key ideas are waiting for you in this protein purification handbook.